Juan Ponce de Leon (1460?-1521) was a Spanish explorer and soldier who was the first European to set foot in Florida. He also established the oldest European settlement in Puerto Rico and discovered the Gulf Stream. Ponce de Leon was searching for the legendary fountain of youth and other riches. 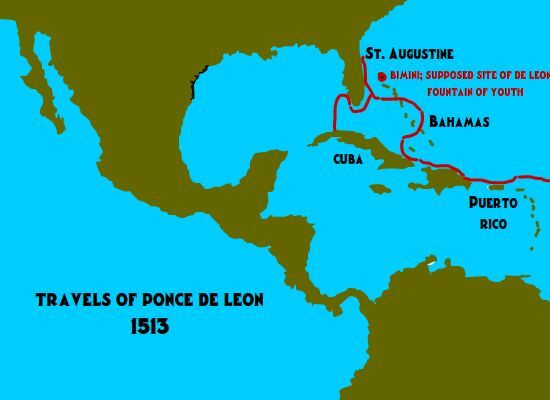 Ponce de Leon sailed on Christopher Columbus' second expedition. He did not return to Spain with Columbus. His first expedition was in March 1513. He had three ships and about 200 men. They soon came to the east coast of Florida (St. Augustine). He claimed the land for Spain. His last expedition was to the west coast of Florida. They were met by Native American warriors. Ponce de Leon was wounded in this fight. He later died in Havana, Cuba, from this wound. He is buried in San Juan, Puerto Rico.